"Make it Happen" - more the mantra of a life coach consultancy than the new tax-cutting agenda for the Liberal Democrats. But for Nick Clegg and his right-hand man Vince Cable it has finally happened. They have been on a repositioning exercise in Bournemouth this week, swimming against the tide of the party's traditional tax-and-spend image. The vote was a big test of Nick Clegg's authority. His plan to cut public spending by £20bn and then use some of that in tax cuts for the less well off is a seismic shift in policy. Some activists had cried that it was a move to the right, an attempt to mimic the Conservatives. That dissent was voiced in an amendment to the leadership's main motion. At the outset of the debate sounded like a Lib Dem love-in, but it developed into a more passionate affair with powerful arguments from delegates and MPs on both sides of the debate. Party left-wingers insisted that reducing inequality was more important than cutting taxes. Evan Harris, the Lib Dem MP for Oxford West and a party veteran - albeit a youngish one - said the party had gone far enough. It had already committed itself to cutting 4 pence off the basic rate of income tax to be paid for by taxing the rich and clamping down on avoidance scams. There were also questions about the numbers. How much of the new £20bn of savings would be used for tax cuts? As the party's figures man, Vince Cable wound up the debate for the leadership. He said it was time for people on low incomes to have more of their own money to spend. He pleaded with conference to back his plans. But he had no need to worry. In a show of hands the motion was easily carried, the rebel amendment defeated. 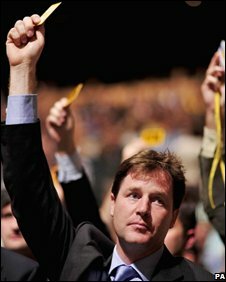 Nick Clegg had passed his first big test at conference. The rest of conference should be plain sailing, as long as there are no unforeseen mishaps. The bigger problem will be getting their new message out to voters. The tax-cutting part is designed to fend off the Tory threat to Lib Dem seats in the south of England, and to offer more help for the poor - the party's line of attack against Labour in the north. But being heard over the din of Labour's death throes - Nick Clegg's words not mine - will be difficult if not nigh on impossible. Still, there could be years of shouting to go until the next general election. Do you support Lib Dem tax plans?